Begg and Lorne Campbell, 1921. Single-storey and attic cottage with crowstepped end gables, shouldered gable-end stacks, asymmetrical forward-facing gable to front, and dormer with shaped dormerhead to rear. Canted corner to NW with inscription THE LADY ROWAND ANDERSON MEMORIAL COTTAGE. Snecked, rake-jointed, yellow sandstone with grey sandstone ashlar window and door dressings. Base course. Eaves course. Non-traditional uPVC doors to E and W; main door to W in roll-moulded architrave with cartouche above, inscribed MA 1929 RRA; cartouche flanked by scrolls and surmounted by angel head. Irregularly fenestrated. Predominantly 16 and 24-pane glazing in modern casements. Shouldered stacks with red clay cans. Graded grey slate. Cast-iron down-pipes. An attractive and unusual cottage in a prominent position at the junction of Thorburn Road and Colinton Road. Lady Rowand Anderson died on 21st January 1921. She was the wife of Sir Robert Rowand Anderson, the eminent Edinburgh architect, who died in June of the same year. 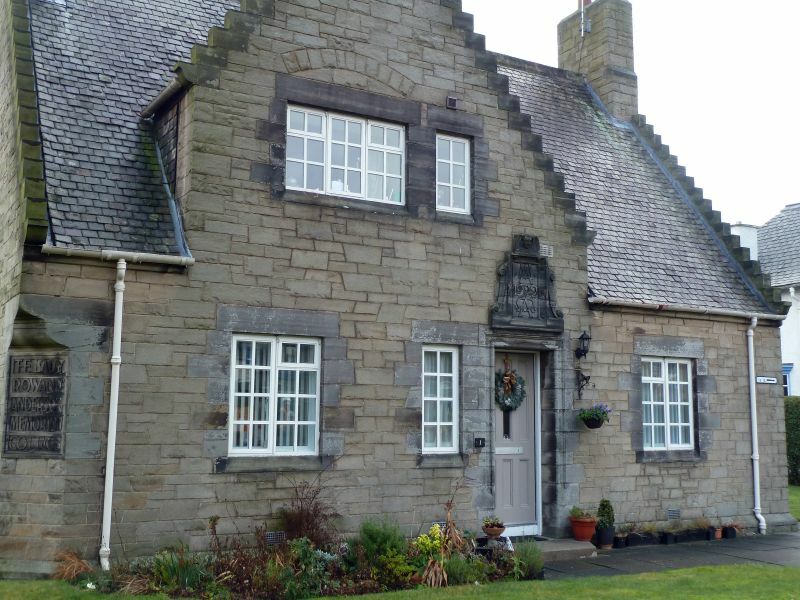 He made a bequest of #3000 for the building of this memorial cottage, which was to house the Colinton district nurse. The cottage is now part of the Aged Christian Friend Society Cottage Homes. Lady Anderson (nee Mary Ross) was the daughter of Henry Ross, a tenant farmer of Kinnahaird, near Strathpeffer. She married Anderson in 1863 and carried out a lot of charity work in Colinton, where she was very highly regarded by the residents. Alexander Lorne Campbell was a friend of Rowand Anderson, and an executor of his will. He built several other houses in Colinton. John Begg had spent much time in India as Consulting Architect to the Government of India, and later Architect to all India. He returned to Britain after the Great War, and formed a partnership with Lorne Campbell in 1921. This, therefore, must have been one of the first buildings by the firm.